Kathleen Michele Myrick and Tad Alan Remy were united in marriage Saturday, Jan. 31, at Peace Lutheran Church near Albert with pastor Patricia Reep presiding. The bride is the daughter of Mike and Johanna Myrick of Larned. The groom is the son of Tom and Lynley Remy of rural Burdick. He is the grandson of Elinor and the late Lee Remy and John and Sue Gutsch. The bride, given in marriage by her father, wore a strapless a-line, ivory gown of organza. The fitted bodice featured embroidery and crystals. She carried a bouquet of red silk roses and pearls. Lynzi Myrick, sister of the bride, served as maid of honor. Bridesmaids were Carissa Shaver of Larned, Catherine Seeman of Larned and Melissa Fry of Hays. The bridesmaids and maid of honor wore floor-length, strapless, dark red dresses with a sweetheart neckline. Tye Remy served his brother as best man. Grooms?men were Trent Hesterman of Kensington, Josh Leach of Manhattan and Jeremy Myrick of Hays. The groom?s attendants wore black tuxedos with red vests and ties. The groom wore a black tuxedo with purple vest and tie. Ring bearer was Arion Stokes, son of A.B. and Tasha Stokes. He wore a black tuxedo and tie to match the groom, and carried the rings on a pillow made by the groom?s mother. Kara Jo Kingsbury, daughter of Austin and Angela Kingsbury, was the flower girl. She wore an ivory dress adorned with purple and red rose petals sewn into the skirt. The dress was created by the groom?s mother. The fathers of the children are coaches on the Larned High School football staff, along with the groom. Susan Tammen, aunt of the bride, was pianist and organist. Kenny Roe, friend of the groom?s family, played ?Trumpet Tune? as the couple recessed from the church. A reception consisting of a dinner and dance was held in the J.A. Haas building in Larned. The bride is a 2009 graduate of Larned High School. She graduated from nursing school in 2014 and is employed as a registered nurse at the Pawnee Valley Hospital in Larned. 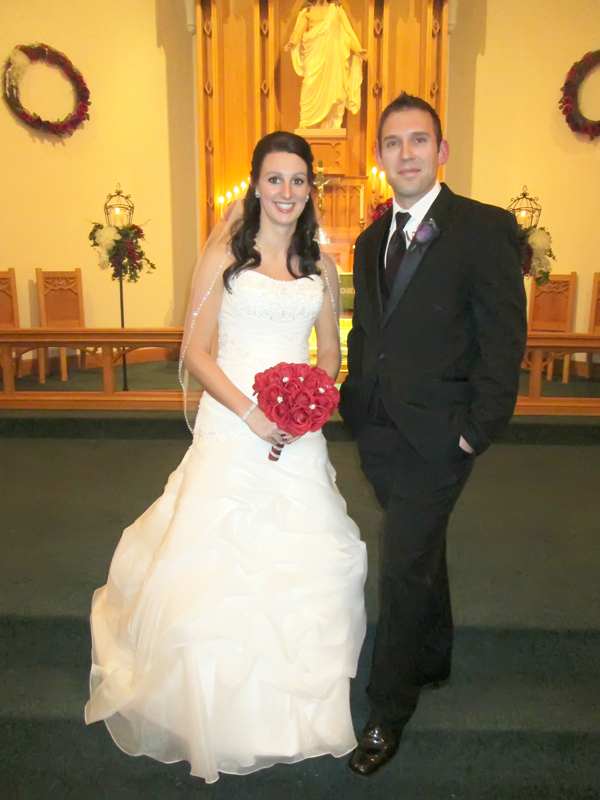 The groom, a 2006 graduate of Centre High School, is a 2012 alum of Kansas State University. He teaches middle school social science and coaches high school football in Larned. The groom?s family were hosts of the rehearsal supper in the couple?s honor in the Peace Lutheran Church fellowship hall following rehearsal Friday evening. The couple is at home in Larned.